Welcome to MOVEMENT, an exciting and powerful effects engine that adds simple-to-mind bending rhythms to any input in real time - from guitars and keyboards to synths, pads, drums and even full mixes. 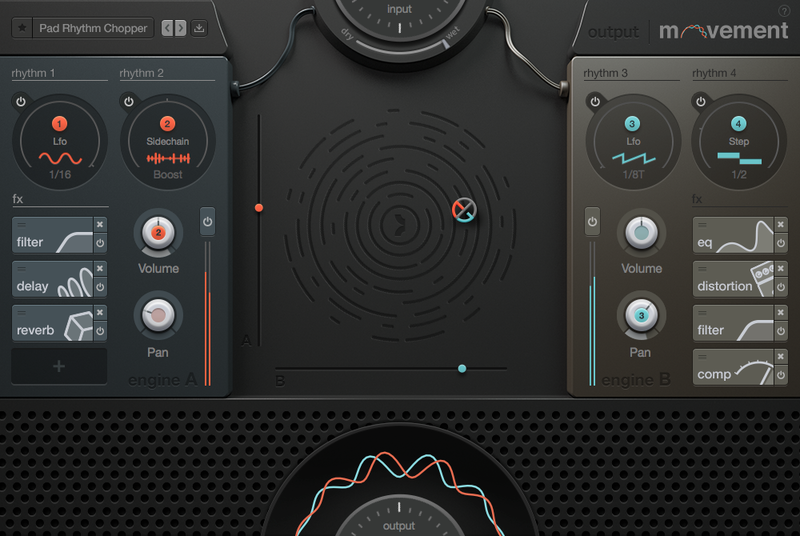 Built equally for studio use and live performance, the creators of EXHALE, SIGNAL and REV bring you a tool that pushes the possibilities of your music. Your Sounds. Powerful Rhythms: The basis of MOVEMENT is simple: dial in a rhythm from one of 300+ presets or from build from scratch and then use the XY pad to tweak in real time. Perform live with it, automate it in your DAW or just find the perfect blend of the original input and the rhythms. You’ll quickly see that no matter how subtle or crazy the tempo-locked rhythms are, they’re built to be musical. 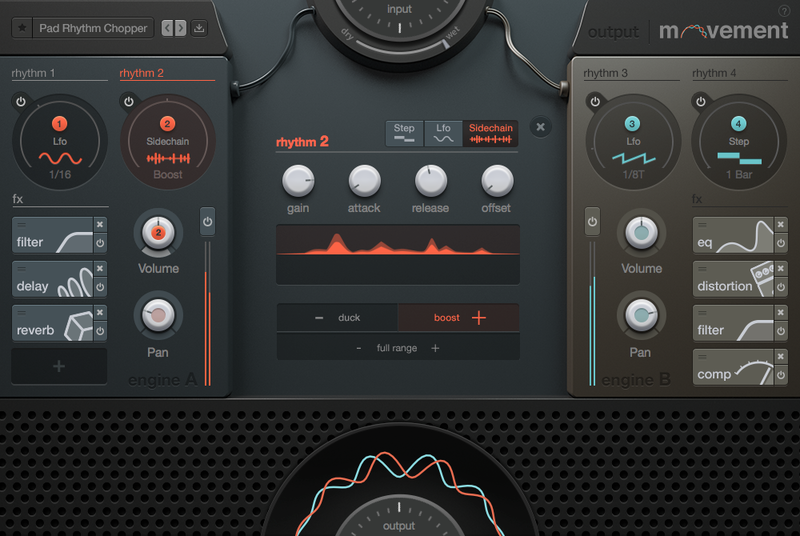 Movement’s power comes from blending the original source with 4 unique rhythm engines, each with Sidechain, LFO, & Step Sequencer based modulation, as well as Output’s proprietary Flux and Randomizer. In addition, there are 76 parameters available to modulate and help add motion to the sound. Reverbs and compressors pumping, analog modeled filters and EQ’s opening and closing, delays morphing and tube distortion warming and cooling the input are a few examples. And as the source is split from the onset, you can bring rhythm in and out to taste. 315+ Tempo-synced melodic loops with a great interface! Subtle shifts and gradually evolving rhythms. A network adapter and an active internet connection is required to authorize / activate this software the computer you intend to use this software on.